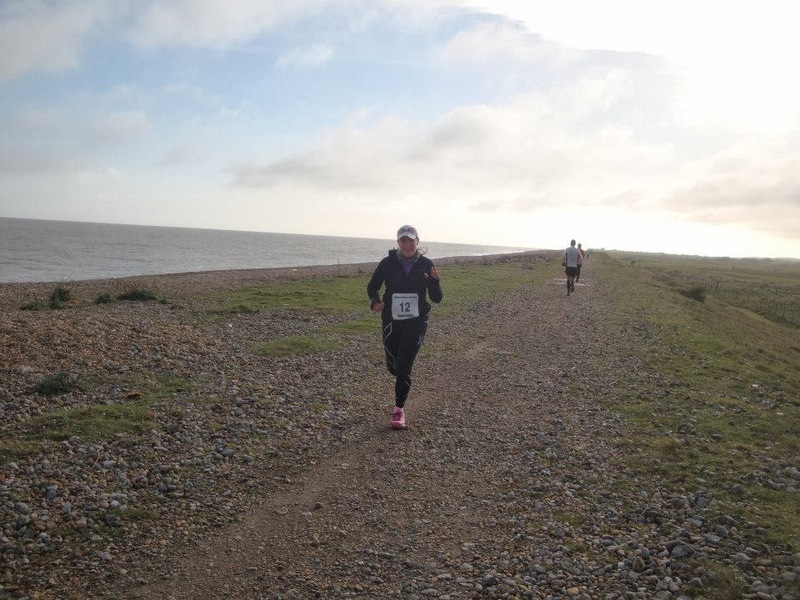 On Saturday, I ran the Saxon Shore Marathon. I hadn't really thought about it too much in the run up over the last week, but work was very busy and I hadn't managed to run as much as I'd hoped so you could say I'd had a taper ;) I also made sure I carb loaded the day before with pasta for lunch and a dinner of fish and chips! I had to get up in what felt like the middle of the night on Saturday to get ready and down to Deal in Kent in time for an unusually early 8am race start. I made it in good time though, parked up and went to collect my number, seeing lots of familiar faces on the way – Saxon Shore really is a marathon full of the usual suspects from the circuit and it has a brilliant, supportive atmosphere because of that – everyone’s very friendly and chatty. “Starting from the remains of Sandown Castle, runners will complete a short 0.6 mile loop before heading out to the Saxon Shore Way for 4x 6.42 out and back loops arriving back at base camp. The initial part of the trail is a wide grassy/sandy track. The path then veers onto the sea wall. This is a raised bank of solid earth, topped with compacted sand, gravel and shingle. There is then a straight, well tarmacked road before reaching the white gate – this is the turn-around point." The weather when I arrived was pleasant enough, in that it wasn’t raining, but it was bitterly cold and windy and we were all commenting on it. I think everyone was a bit worried at how much worse the wind would be when we were running along the exposed ridge of the sea wall! Unfortunately as soon as we got up to the sea wall, as we’d feared, the wind really did turn into an absolute menace. Someone told me later that the winds were about 20mph and we were running right into them. It was incredibly hard work. However, once we got to the turn around after 3.5 miles of running into the wind, the difference running in the opposite direction made was fantastic – not only was it warmer without the windchill, it was just so much easier to run, and you could start to appreciate the view of the sun rising across the sea because for a few miles your head wasn’t bowed down into the wind! Finally though, the end was in sight and I was on my final lap. 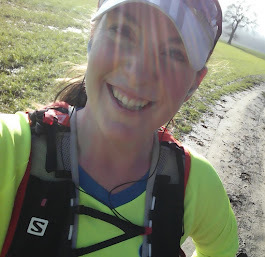 I was walking much more than I’d hoped to…a couple of weeks ago I was talking about matching last year's time for the race…but in the relentless, energy sapping wind, my time really was the least of my worries. I also didn't have a very clear idea of my pace, as although my Garmin had been running as a stop watch, it'd failed to find any GPS signal, and wasn't much use at all. As I got to the last section of the trail though, I could see I was likely to get a sub 4:30 if I made a bit more of an effort, and so ran for that, ending up crossing the line in 4:28:02 which I was quite happy with. It wasn't comparable conditions to last year, or to the Enigma marathon a few weeks ago, so i'm not going to worry about comparing my times. Saxon Shore is famous for the goody bags you get after the race – there’s a giant toblerone, crisps, biscuits, more chocolate…even a can of cider! It’s incredible, and the medal is a stunner too. Absolutely worth running 26 miles for! Unfortunately though, I couldn’t hang around at the end enjoying my goody bag and watching the other runners finish as I'd planned – it was just too cold – and so I soon retreated to the warmth of my car and headed back home. The best news is that I woke up the next day without an ache or any stiffness – felt absolutely fine. It took me a few days to recover after the last one, so I’m really pleased that my fitness is coming back and is demonstrable in that way. Now I’m really looking forward to the Portsmouth marathon which is in 3 weeks’ time – I haven’t run Portsmouth before and it’ll be great to try something new! Well run! Simply reading your upcoming schedule makes me feel out of breath, wishing you all the best. Saxon Shore seems like a lovely race! Didn't realise this was in Deal, I may enter for next year as my Dad lives there. He didn't know about the race either, even though he lives a hundred yards from the start. In order to improve my cardio performance for better running, I am taking special nutritional supplement. Haven’t seen anything like that before, but recently found this new product by Military Grade. The name of the product is Cardijex. It enhances heart health, therefore, helps me to intensify my workouts. Now it is easier for me to increase my mileage. Besides, it promotes calorie burning. Perfect combination for me!